Modern Experimental DKK 80/50 kr. Called "talented and dedicated" by Arts Birmingham, and described as displaying "aggressive and virtuosic prowess" with "brilliance of sound, technical mastery, and stunning expressivity" by I CARE IF YOU LISTEN, violin duo Miolina has been attracting audiences since their inception in 2012. Mioi and Lynn are keen on creating and shaping the violin duo repertoire in the 21st century. To date, the duo has had successful performances in NYC at Brooklyn College, The Church of the Transfiguration, City Lore, Gallery MC, Goddard-Riverside, Greenwich House Music School, Lenox Hill Neighborhood House, (le)Poisson Rouge, The Morbid Anatomy Museum, National Opera Center, NoMad Loft, Parsons School of Design, Queens Library, Rockwood Music Hall, Spectrum, St. Mark's Church, Tenri Cultural Institute, and Turtle Bay Music School. Outside of NYC, they've performed at the University of Alabama and St. Paul United Methodist Church in Birmingham, AL; Experimental Sound Studio in Chicago; Monk Space in Los Angeles; Pensacola State College in Florida; Center for New Music in San Francisco; Corner Store Arts and Rhizome in Washington, DC; Cité Internationale des Arts, La Fine Gueule, and l'Institut Finlandais in Paris, France; and Koendori Classics and Monten Hall in Tokyo, Japan. In 2017, they premiered Victor Kioulaphides' double concerto with the North/South Consonance Chamber Orchestra in NYC. In addition, they have performed on series and festivals such as BAMA, Circuit Bridges, Composers Concordance, COMPOSERFest, Electronic Music Midwest, Infuse Présente, JUMP, NWEAMO, and Sonic Circuits, and have presented masterclasses and worked with composition students at CUNY Queens College, and The Juilliard School. They have also done outreach concerts at The Alabama School for the Deaf and Blind, and at Greenwich House Senior Center and Southbridge Senior Center, both in Manhattan. Miolina specializes in violin duo music that employs the natural beauty and sound of the instruments, with or without electronics and video. They enjoy collaborating on new compositions with composers, as well as discovering hidden gems of the past. Some of their recent collaborators include artist/multi-instrumentalist Ken Butler, cellists Jennifer DeVore and Craig Hultgren, percussionists Ian Ding and Eric Millstein, pianist Laura Ahumada, soprano Sharon Harms, and violinists Mari Kimura, Masha Lankovsky, and Machiko Ozawa. Miolina's future productions include creating music for silent Japanese films of the 1920s, and an educational program about immigration and its influence on composers. In June 2017, they were chosen to join New Music USA's Impact Cohort. Support through New Music USA's NYC New Music Impact Fund is made possible with funding from The Scherman Foundation's Katherine S. and Axel G. Rosin Fund. They are also recipients of a 2017 Japan Foundation NY grant, a 2015 grant from the Lower Manhattan Cultural Council, 2014 & 2016 grants from New York Women Composers, and a 2018 grant from the Queens Council on the Arts. In 2017, they were chosen for an artist residency at Avaloch Farm Music Institute. 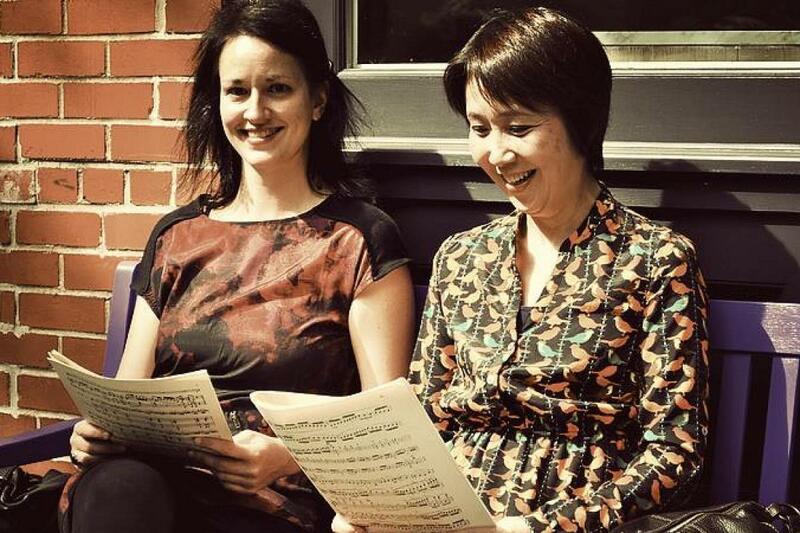 Both Mioi and Lynn became board members of New York Women Composers in 2018. Miolina is a 501(c)3 non-profit. Their self-titled debut album was released on Composers Concordance Records, distributed by Naxos, in February, 2018. Available on iTunes and at Amazon.